A little know variant of the Model 1914 Ball grenade. Time delay fuze. Common components to make different grenades. A "Timeless" classic WWI grenade. Rivals the British No.3 in mechanical complexity. 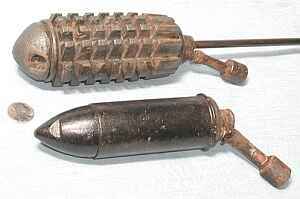 British No.23 MkII "Mills Bomb"
The Rod Grenade - One of the last of its kind.